This is a somewhat longer article that gives a summary of the strategy you can also find in this talk. It first appeared in French here. Let’s assume that if you’re reading this, you agree that, apart from all kinds of other changes, your ideal world is a world where animals are not used for human purposes, be it food, clothing, research, entertainment, or whatever. A vegan world, in short. Can we ever achieve a vegan world? Right now, it doesn’t look too good. To use Melanie Joy’s so called “three N’s of justification”, meat is natural, normal and necessary. And to add two more N’s: it’s nice (tasty) and it’s not the first and only thing we worry about. Also, demand for meat, dairy and eggs is expected to grow a lot in the coming decades, because of the increasing purchasing power of people in upcoming economies, like China and India, which together represent one third of the global population. Still, I’m optimistic. I think a vegan world is an obtainable goal (although it of course depends on what we consider to be a vegan world exactly, but let’s not have that discussion). The question then is: how do we reach that goal? The most obvious idea, and the strategy that gets the most emphasis from both individual vegan/animal rights activists as well as from most organisations is simple: try to convince as many people as possible to go vegan, by explaining them that animals suffer or deserve respect and even rights. This is an important part of the strategy, but it is definitely not the only required part and it is maybe not even the most important part. I believe the social struggle for animal rights is the biggest and most challenging struggle of them all. To win it, we’ll need different tactics. But first, let’s see why this struggle is so difficult and different. Take into account also the incredible degree to which our society is dependent on animal products. Most people, especially in the western world, have animal products at every meal. That’s three times a day, every day. Huge economies depend on the consumption of animal products, including also big parts of the clothing, research and some entertainment industries. We are invested in the (ab)use of animals to a degree that we probably have never been invested in the “use” of for instance black people, women or children. This obviously makes the whole system suffer from a very high degree of inertia. It’s good to take that into account. Another reason for inertia is this: the main behavior (in terms of volume) that we are trying to change is eating behavior. Our food habits are sort of ingrained in us, maybe more so than anything else. What we eat is tied to emotional and psychological factors. We can be addicted to food, and some researchers believe that some food products or ingredients may have a level of addictiveness comparable to hard drugs. When it’s about food, we don’t think with our mind but with our taste buds or our stomach. Meat eating has been part of our history for hundreds of thousands of years. Many people experience some part of primary craving for it. Conversely, what makes our challenge even bigger is that our opponents have it quite easy: their message (that eating animals is ok, normal, healthy…) is one that the large majority of the public wants to hear. It’s a message that the industry throws out their with billions of advertising money. The above factors (as well as others) should be taken into account when strategizing about our movement and how to get to a vegan world. This is not to say that no comparisons are valid and that there are no similarities, but it means that we shouldn’t be too quick to draw conclusions based on what happened in other movements. We are largely in uncharted territory. 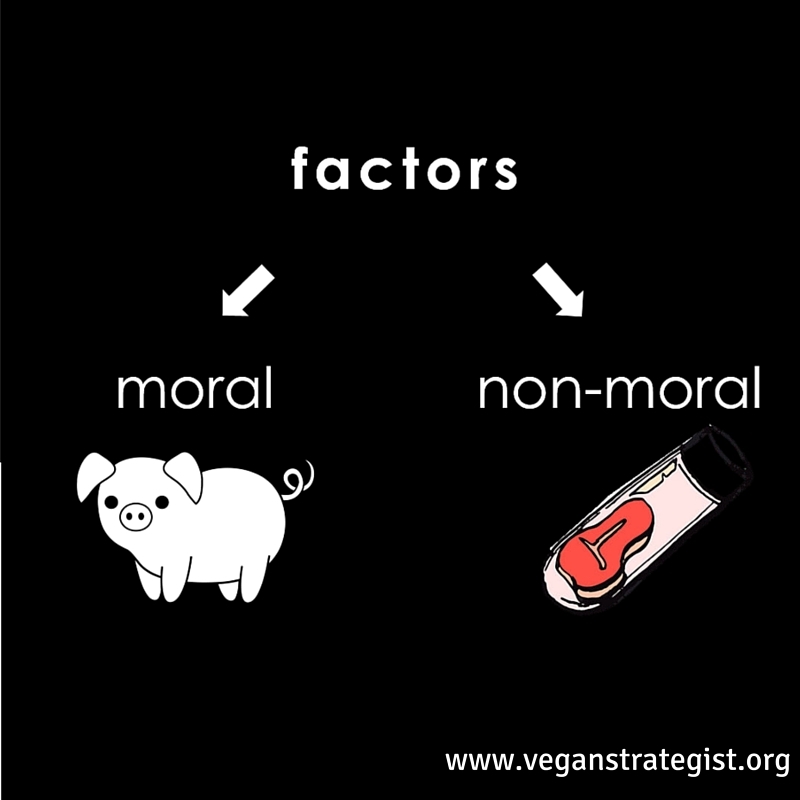 When we look at the factors that can influence individuals (and society as a whole) to go vegan or progress towards veganism, we can make the following distinction: there are moral factors and non-moral factors. Concern for animal pain and suffering is the main moral factor or argument that we use. We hope that by considering the plight of the animals that they eat, people may change their behaviour. Non-moral factors are factors that can motivate or help people to eat or go vegan as well, but which have in and of themselves nothing to do with morality. For instance the environment in which individuals find their food and eat can be conducive to them eating vegan or not. A wonderful selection of great tasting meat and dairy alternatives could convince people to choose them without any thoughts of the animals being involved. Concern about one’s health is also a non moral factor (though I would never call it selfish or egotistical, as some people do). In our movement, we focus mostly on the moral factors. We spend a lot of time telling people that animals are sentient beings, that they have a right to life etc, saying that that is reason enough for them to change their eating habits. Why do we focus on these moral factors? In part, because we think this focus is the most effective thing we can do. And we think they are effective because they are what convinced most of us who are vegetarian or vegan at this point. That we were moved by those factors, however, doesn’t necessarily mean that others will be too. Indeed, if it worked for everyone in the same way, we should have a lot more vegans already, obviously. You could see the present day vegetarians and vegans (a couple of percentages of the population) as the innovators and early adopters on the “diffusion of innovation” model. The rest of the population – the so called early and late majorities, and obviously the laggards) might very well need different ways to be convinced – because they are different people, with different interests – than us. Briefly put, when we advocate, we should always keep the following in mind: that you are not your audience. The right thing for the right reasons? Not only do we believe that these moral factors work well, we also want them to work well and we want people to be convinced by these moral factors and nothing else. We want people to be vegan for the right reasons, which is to say: because they care about animals. I guess this is because we believe that only people really caring about animals provides real and lasting protection for them. We have doubts that a vegan world will ever come about as a result of a lot of health or foodie vegans, and for good reason. There may be other reasons too, more personal ones, but I’m not going to start psychoanalyzing. So because 1. we think a focus on moral arguments works and 2. because we want people to do the right thing for the right (moral) reason, our movement has very explicitly focused on it for the past few decades. The problem with moral campaigning however, is that it’s not enough. One thing we can learn from other movements, and in particular from the anti-slavery movement (and here is a parallel with other movements which I think we can draw), is that the good fights are not won (if they are ever won) with moral arguments alone. In the case of slavery in North America, not only was it ended by an actual war, but also other things were really important, like the invention of the steam engine which could automate certain tasks and could make them cheaper than working with slaves. In the case of the animal rights movement, these non-moral factors are arguably even more important. If you would draw the case for the moral arguments to its logical extreme, you would argue that we have a duty always and everywhere to avoid animal products (let’s restrict ourselves to diet here), even in the case of us having only water and bread as our only meal for the rest of our lives. Now, that may morally make sense, and many present day vegans would not turn their back from veganism even if all they could eat was water and bread. However, we can easily imagine that every advance in alternative products (both in quality as well as quantity or availability) makes it a lot easier to further evolve on the scale towards veganism. To put it another way: as the offer of alternatives for animal products improves and increases, the required moral motivation or concern shrinks. This is a good thing, because we don’t have people’s motivation directly under our control, nor do we control their compassion or discipline to change. For those of us who want people to go vegan for the right reasons and actually care about animals, there is good news though: attitude change can follow behaviour change. Let me explain. In our movement, as in most social movements, we usually work like this: we want to change people’s attitudes or beliefs about something, and hope that these changed attitudes will make them change their behaviour. In our case: we try to change their attitudes about animals by informing them about how animals are sentient beings who can suffer, deserve rights and respect, etc. We hope they understand this and then take the next step, which is to stop eating animal products. This works sometimes, but probably not often enough. Not only are we unable to make many people care (we don’t have much control over their caring), but some (maybe many) of the people who actually do care, will not change their behaviour (this is called the attitude-behaviour gap). Indeed we may assume that deep down, most people do care about what happens to animals in e.g. factory farms. Most people, however, are not vegan. They are not putting that caring into practise. The reasons for this are many, but one of the main ones is undoubtedly that it’s generally not convenient enough to do so. When people’s behaviour changes first though (i.e. without their beliefs having changed), this behaviour change can influence their beliefs. You may notice the parallel with what I wrote about before: moral reasons and non-moral reasons. People can change what they eat for non-moral reasons: they may be in an environment where there’s great vegan food, they may be eating it because someone else prepares it for them daily. In the future there may be vegan alternatives just about everywhere. In some situations vegan food could be the default option and people may choose this option without thinking. Now what happens is that once they experience that vegan food is good to eat, is doable, affordable, etc, they get more open to the animal rights arguments because they are no longer afraid of losing something. They know and have experienced already that there are great alternatives for animal products, so they don’t fear missing out. This time they are less prone to avoid reading an article on animal suffering or avert their eyes when they see coverage of factory farms on TV. They are less likely to dismiss it. Let me illustrate how behaviour influences beliefs with a concrete example. Imagine a bullfighter and a slaughterhouse worker. These two people basically do the same thing: they kill cows. Now if you would ask non-vegans who of the two persons they feel most angry with, the answer will be: the bullfighter. Why is that? In part it is because many people see bullfighting as senseless violence while they see slaughtering an animal for meat as a necessary thing to do. Food is in their eyes less trivial than entertainment. I think, however, that this is not the main factor at play here. I think the main difference is this: most people are not involved or invested in bullfighting (they don’t attend bullfights or don’t watch them on TV), but are invested in the slaughtering of animals because they eat meat. Behaviour influences beliefs. It is much harder to judge or condemn something you do yourself. It is easy for most people to condemn fur because they are not wearing fur. Another way behaviour change comes before concern for animals is of course when people go vegetarian or vegan for health reasons. Research shows that in a significant part of the cases people who go veg for health reasons develop (just in the way I described above) a concern for animal suffering, and often ethical vegans started out as health vegans. I think the concern of some vegans that health is not a good motivator or argument to talk about veganism because it is less “sticky” (i.e health vegetarians or vegans will be more prone to give it up) doesn’t hold much water, because without the health argument we might have had way less vegetarians or vegans in the first place, and secondly many people, as I stated, evolve in their motivations over time. This objection is mainly a reflection of us wanting people to do things for the right reasons. (On the other hand, health benefits of veganism shouldn’t be exaggerated, and potential nutritional pitfalls should be explained). As you may be able to see, what I described above is not about making people vegan directly. By experiencing vegan meals and products, people slowly change their behaviours and beliefs, and many will eventually arrive at being full fledged vegans because they care about animals. However, this is not to say that all the people who reduce their meat consumption are of no value in and of themselves. On the contrary. I believe the fastest way to a vegan world is to emphasize the reduction of animal products (in tandem with a “go vegan” message that is carefully targetted at some audiences and in some circumstances). People will be a lot more inclined to actually do something when you ask them to take a step they can imagine really taking. For most people, the question to go vegan will be a non-starter. That doesn’t mean there should be no outreach material or groups or individuals that are using the “go vegan” message. It just means that there should also be a message out there to reduce (and maybe this message should be more prominent than the go vegan message). The important thing here is that a big group of meat reducers is the fastest way to increase demand, and thus supply. The more meat reducers there are, the more veg products will appear everywhere, and the more easy it will become to to go totally vegan. It is crucial to bear in mind that many of us may be vegan thanks to the fact that it is now a lot easier than before, and that it is a lot easier thanks to… the big group of meat reducers asking for veg products (rather than the still tiny amount of vegans). To put all this together: apart from the “go vegan for the animals” approach, there should also be an approach that focuses on behaviour change first. This behavior change can be for whatever reasons (health; the availability of great alternatives…), and to whatever degree (meat reduction, vegetarianism, Meatless Mondays…). Just like people can evolve in terms of their motivations, they evolve in terms of their frequency of meat consumption. A big group of meat reducers will increase the supply, making it easier for everyone to go vegan. When vegan products and meals become even more available, and certainly when they come closer to being the default option, spreading the animal rights message will be much easier, as by then both individuals and society as a whole will be less dependent on animal products. This also means that at this point in time, it is extremely important to focus on creating amazing alternatives for animal products, both in supermarkets and in restaurants. Wow, amazing writing and insight, Tobias. 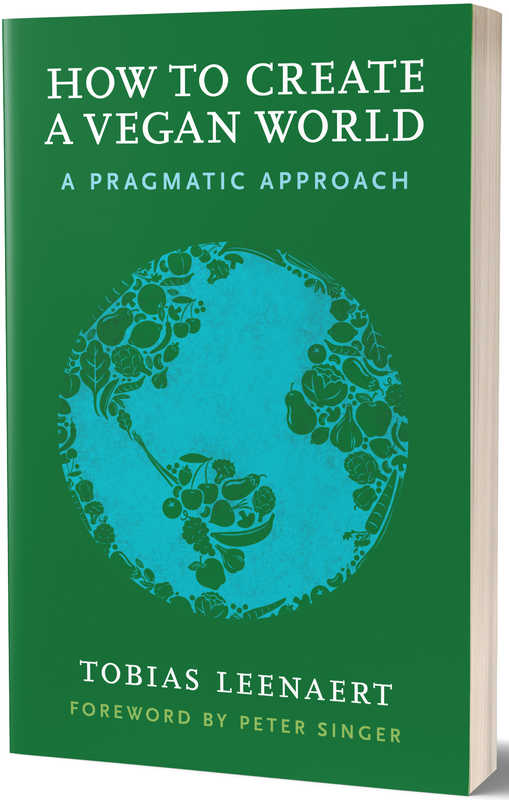 This should be mandatory reading for anybody who wants to move beyond just wishing for and talking about a more humane world, to actually creating that world. When I first found out about factory farming and became an activist against it, I assumed that other people were like me, and they just didn’t know about it. And once they were made aware of the issue and the horrible suffering, I naively assumed they would change like I did. It took me several years of tough experience to realize this wasn’t true about most people. That factory farming actually even existed was a very hard truth for me to accept, but just as hard was realizing that people weren’t going to be moved by morality and compassion alone, like I was. Whomever the audience is, I’m ultimately going to be held accountable by the animals and what I’ve done to actually reduce their suffering. If the audience I’m speaking to isn’t moved by compassion or morals, then I’m going to move on to whatever might actually help the animals. If one of those reasons lessens even just one animal’s suffering, then I’ll take it. The animals don’t care about the reasons their suffering is reduced; they only care that it happens. I’m often the target of this strategy and I can tell you, it certainly doesn’t give me a good impression of the person doing it and it just comes off as someone trying to convince you at any cost. At least when dealing with an educated audience, I think its important to build a strong case and be intellectually honest. I don’t think there is a strong case for veganism, arguments for veganism tend to be riddled with fallacies and other issues. But you can make a strong case for some components of veganism, indeed some of the core components, but it seems few vegans are interested in that. They insist on a vegan world and full ideological commitment, I find that deeply problematic and a hurdle to moving forward. toad, i understand what you mean. what do you think about vegan (avoiding animal product) as one heuristic, among possible others? Well….a heuristic to what end? But this seems like a counter-factual, vegans don’t consider veganism one heuristic among others….instead they often willfully attack others (vegetarians, pesco-vegetarians, environmentalists, etc) or consider the others as roads to veganism. Veganism is an entire ideological package…..and I just don’t think many vegans see that. I appreciate your feedback 🙂 So, what you’re saying is that “ethical vegans” will probably do it 100% short-term but this may not work long-term? And does that means that being almost but less than 100% vegan so to make it more comfortable may be better long-term? i wrote about it here. there’s study by HRC (now Faunalytics) that showed that 75% of vegs drop out, and that those who had ethical reasons lasted longer. Some people have made the conclusion that we should always talk about the animals, but i think that’s not a conclusion you can make from this. I’ve heard a lot of vegans talk about focusing on morals, yet these same vegans rarely give any sort of rigorous ethics-based arguments for veganism. Its a strange thing and I don’t think its just the academically oriented folks that notice this discrepancy. It would seem that by morals, what we are really dealing with is an appeal to emotions. Alternatives, eat least for meat, have existed for thousands of years so the creation yet more alternatives isn’t going to achieve anything that hasn’t been achieved already, the real issue is a cultural shift in dietary practices. Speaking of which, you mention emotions and psychology in relation to food but not culture…..but food is inherently culturally. You’d think the perspective of anthropologists would be instrumental here…….but I don’t see anybody considering their work. With modern science, hipster start-ups, well-funded organizations promoting veganism……none of it has even come close to achieving what has occurred, organically, from culturally innovation centuries ago (e.g., vegetarianism in India). In any case, veganism requires a sort of leap of faith….until one can actually bridge the gap between scientific and philosophic considerations to vegan doctrine a vegan world will be about as likely as a Christian or Muslim world. A big concern is that health or global warming arguments are great arguments against red meat/beef –> a potential catastrophe for chickens / the total amount of animals suffering… Do you not see this as a problem? I agree with everything else, especially “better/more convenient vegan food” (or at least chicken-and-fish-free) and incrementalism. I think we still need MUCH better meat alternatives. This is what happened for me, I started eating a plant-based diet and then became vegan and activist. I think no more eating meat gives you clearer thought and so you become more aware of how wrong you were and how wrong you still are if you still wear animals products. Moreover, you are more prone to meet ethical vegans that can help you become vegan. christian, i’m still collecting data, but 1. anecdotally i’ve heard this a lot and 2. what’s probably much more true (because i agree with you there are no good health arguments for 100% veganism) is that people start on the road towards veganism (reducing animal products) for health reasons. i have some different opinions about the meat vs chicen issue, but i still need to write them out 🙂 basically it’s a question of short term vs longer term view. Tobias, how do you know that the demand for and supply of vegan alternatives will eventually outweigh the demand for and supply of animal products? Don’t farmers and food suppliers first have to transition to plant-powered farming and food systems, thus making animal agriculture redundant? You basically summed up my approach to veganism! I used to be a HUGE meat lover. I first turned pescatarian for health reasons and after a year of pescetarianism/vegetarianism I turned to veganism after FEELING the improvement in my health. I strongly believed in the myth of malnutrition before having experienced a iron deficiancy due to my lack of knowledge regarding nutrition. My moral convictions came after. Now I am meat free for two years and I am loving it! I am healthier than ever! Even my family and friends are slowly trying new things and go meat free, coz they see how well I did (plus they really dig my cooking 😉 ). Keep up the good work!